Good afternoon to the Green Army. Bringing you the news you are all so desperate to read. 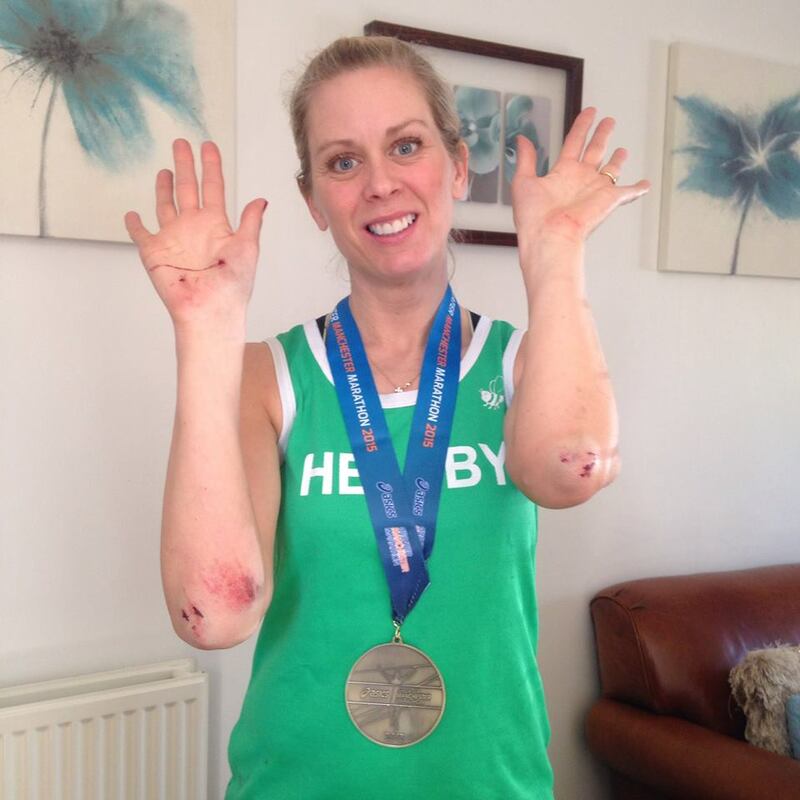 A very exciting (well, not quite Olympic fever but not far off) Sunday was had by many on Facebook as we tracked the London Marathon green vests through their (for many) first time slapping the streets of our capital city. We had Chris BH, Gaz O’Connor, Carl Platt, Degsy “Messi” Morris, Potential Word Record Breaker that is Ste Roach for the chaps and Joanne “FloJoJo” Lacking and Tanya Meredith for the chapettes. 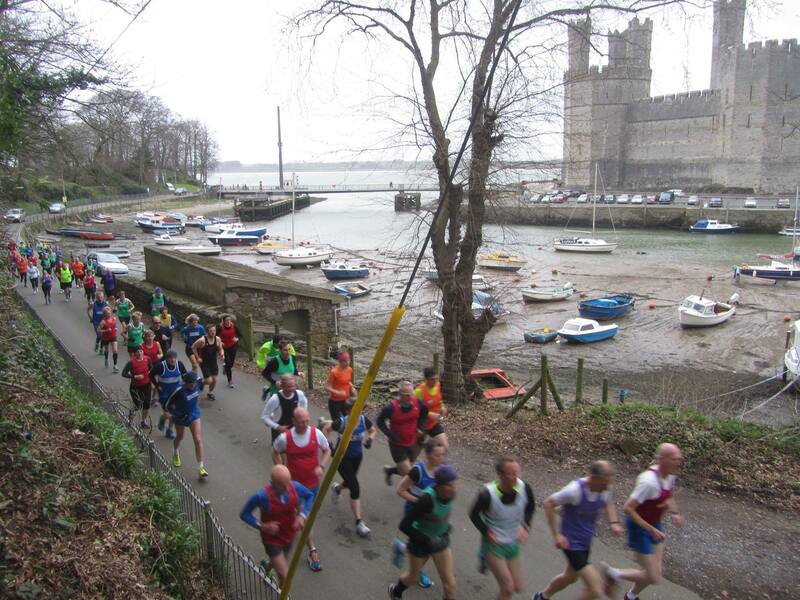 I shall hand you over to Chris BH for his report on this iconic road marathon…. Well, that was quite an experience. Much has been made of my conversion to road running from the hills and I can now confirm my road running retirement! The London marathon was a fantastic experience and I’m forever grateful to the club for the place and the opportunity to compete. For those that were convinced I’d go under 3 hours and ignored my protests of it being set to be a close one I think my time of 2:59:14 makes us both right . Having been put in pen 3 at the start due to a clerical error (having me down as a finish time of 3:24) I managed to fold and pin my number in such a way that I still got into Pen 1 with Jeff McQueen from West Cheshire. A huge relief for me. Being able to run with Jeff was a huge boost. We didn’t do a lot of talking, but at least my cyanosis faded within the first mile of the race. From then on I ran within a metre of some chap called Jenson. Assuming somebody just had their name on their top it took me ~3-4 miles to realise the constant calls of encouragement were because it was Jenson Button. Having paced him to tower bridge I let him head on whilst I did my best to manage the fade in pace. The first half had been great, I saw Laura and the boys at Cutty Sark and was running smoothly and at a pace I felt I could hold. The second half was a different story. The constant screams and noise from the crowd really encourages many, but for me it was a minor prison sentence as I struggle with loud volume noise. Some sections were just a deafening wall of sound which I found really quite distressing… especially as I was going backwards fast! As I rounded the penultimate bend in front of Buckingham Palace my face would have reflected horror as the 3 hour pacer overtook me. Seeing the clock still with 2 as the first digit as I crossed the line was an enormous relief! I’d like to thank everybody from the club, not least for the place, but for the fantastic support, encouragement and banter I had during training for this. Naturally I’d also like to thank my long suffering wife Laura for putting up with me – I think she was more relieved than I was that I dipped under 3 hours! Huge well done to CBH for gritting through the training with Fitzy, we know how much he despises anything that doesn’t have a vertical climb of Empire State Building! A cracking run and a very sought after sub 3 was perfectly executed. Degs was in after Chris, with a very quick 3:08:48 – brilliant for a Professional Amateur Footballer with constant football afflicted injuries ;-). Coming in first for the ladies and with a cracking 12 minute PB was FloJoJo Lacking. Brilliantly paced run by FloJoJo for a 3:18. Then with his second marathon in a week after doing Manchester the week before, was Gaz with a respectable 3:23, huge well done Gaz, no mean feat, especially for an old dude who drinks cans of lager like corporation lemonade pre race. Carl Pratt was behind Gaz with a cracking 3:31, he has been on brilliant form the past few weeks and topped it off with a great marathon time. Then we had the quite possibly mad, Ste Roach who for some reason decided running holding a huge pan dressed in chef’s whites would be a great idea and it turned out on the day he was up against two other runners going for the same record! He did us proud and beat them both and securing the World Record! Brilliant work, Ste. Then last but no means least, Tanya, fresh from her Barcelona marathon only a few weeks ago, ran a PB in 5:09!! Huge congratulations to you all. Next, on to the Borders League final race in Wrexham Industrial Estate and the presentation of awards. There was a huge presence of green vests, especially from the men who were desperate to get their long sought after promotion to the First Division. Which they did! Well done chaps! First time in 15 years they are back up where they should be. Some cracking running from everyone this year,which shows how much the club is progressing. Colin Thompson finished the league in a fantastic 6th overall place! He just keeps going from strength to strength and amazing to see after he used to be a podgy lazy smoker… 😉 Colin Bishop, showing his incredible pedigree at any age, won the V50 by a mile! A huge inspiration to many and I am not sure I have ever met someone with his mental ability to run so hard. Ladies winners were Joanne Lacking who was third in the FV35 category and Carol Shaw, again another huge inspiration to many who won her category too! Well done everyone, the Helsby lot will be a force to be reckoned with over the next few years in this league. PBs and Sunshine in this week’s issue. As a standing reminder: Please remember to send any race reports to helsby-race-reports@outlook.com otherwise it is unlikely to get into the news! On Sunday, 4 foolish souls hot footed off to the “Stadium of Dreams” with dreams of PB’s. Chris Fitz, Ivan, Gaz and myself (Helen) rocked up in their grubby green vests and err, stood in portaloo queues with statue of Alex Ferguson eyeing them up suspiciously. Myself, Gaz and Ivan have all ran Manchester past few years and all had good results from there, it’s a fast, flat PB course. Chris however, had trained for London, only to wait for his number to arrive, it never did and he was told he had not completed his entry. What a plonker. Chris then decided best solution was to smash the Manchester tarmac instead. To the race… All the blokes were gunning for under 3 hours, Chris for a PB under 2:55. Training had gone great for all of them bar Gaz had picked an Achilles niggle up and had not ran much over last few weeks, leaving him feeling lacking in fitness. The weather was on our side, the course was not extended an extra half mile and the support was fantastic, especially from Jo Lacking who took some amazingly stunning shots of us. <sarcastic> Brilliantly, Chris finished at 2:50, a PB of 5 mins. Then Ivan was not too far behind in a HUGE PB in 2:59, day before his 40th birthday! Poor Gaz, he just had a bad race but still finished in a cracking 3:10, excellent for a V65! Surely a record… I managed a 3:50. Was happy with that. I’m never gonna be a Paula Radcliffe but at least I only fell over a traffic cone mile 6 and didn’t defecate on the road. A lovely evening in Chester saw a large green army contingent deployed to battle it out over the 5 mile course, helped to a large extent by it being local and a road club counter. A course broadly consisted of an opening flat section, followed by a reasonable length of descent, a bump back up and a flat finish. With 29 runners in the mix it was always going to be full of club rivalry just within the Helsby ranks, let alone against the other local clubs. Fantastic performances on the day and consistent with this year’s theme, a large number of PBs falling. 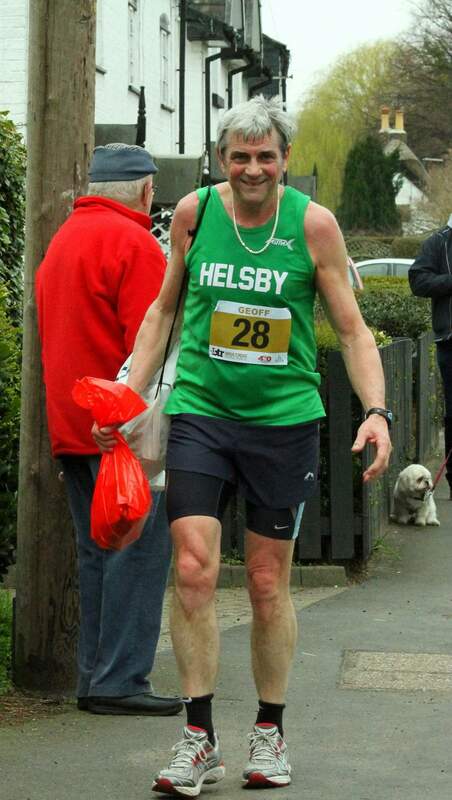 Colin Thompson took the Helsby win by placing 16th overall in 28:04 with Chris Fitzpatrick bagging 31st in 29:20. Derek Morris paced the race to perfection taking third place in the final mile and then teaching the eventual 4th place a very sound lesson in finishing, bagging 47th on the night. In the ladies Jo Lacking stormed round in 34:14 looking to take that form into London on the weekend with Carol Shaw taking 2nd and Helen Owens taking 3rd (no trips over cones in this race!) PBs all round I believe. Fantastic performances across the board – well done Helsby! After some very warm weather, Sunday morning was overcast and rather cool. This didn’t deter the Green Army from turning up in force for the Whitley 10k, a local race down quiet, traffic free lanes. Despite being a bit lumpy in the second half, this race has become a popular addition to the local racing scene in recent years. Well supported by local clubs, it’s a good opportunity to meet up with friends and rivals. The weather conditions turned out to be near perfect for running. 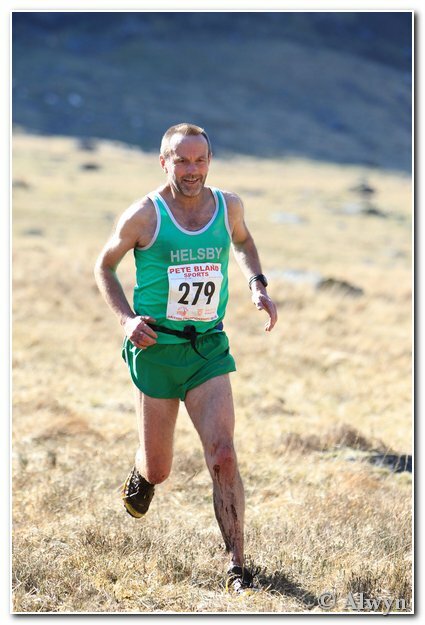 First home for Helsby was the ever green Colin Bishop to secure 5th position overall and an age category win. First home for the Ladies was Carol Shaw. 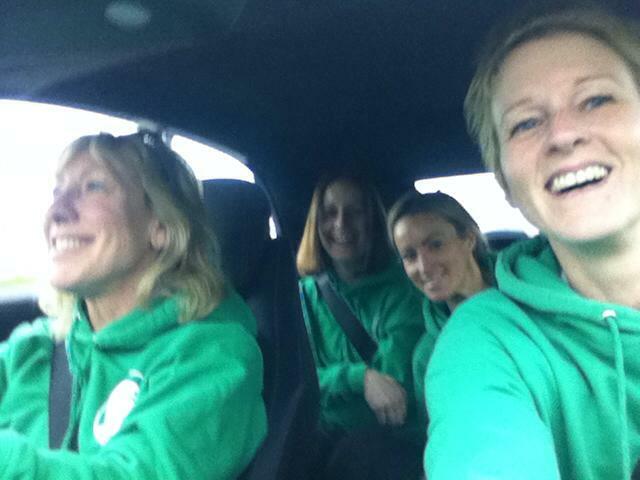 Special mention also to heroic efforts from Jo Farwell and Donna Geer in racing their second 10k of the weekend. Thanks to Andy Smith for the write up! 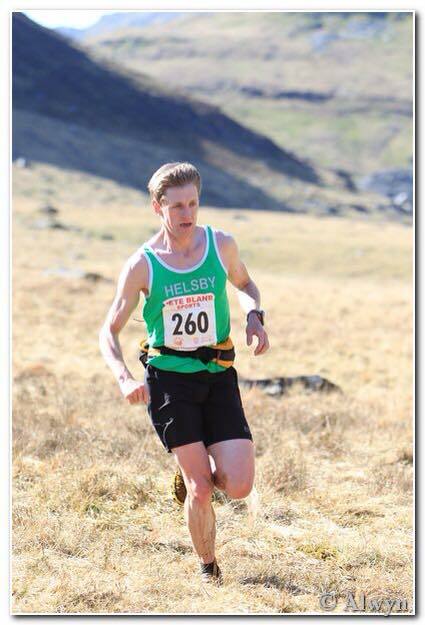 Blaenau Ffestiniog was the starting point for the latest counter in the Helsby RC Fell Racing club championships, Ras y Moelwyn. Blaenau Ffestiniog has an incredible slate mining history (the mines are well worth the visit) and also has superb mountain biking, a giant zip wire and a lovely set of shops; it also has a narrow gauge railway which is hard not to see it as the inspiration for Ivor the Engine… it also rains there… a lot! It’s positions amongst the mountain does mean it has a far higher than average rainfall which is why it was not just incredible to be there whilst a British championship race was on, but also when there wasn’t a cloud in the sky! The race winds up from Blaenau to the top of Moelwyn Mawr (great), makes the technical traverse down and up to Moelwyn Bach (small) before heading back to Blaenau via Llyn Stwlan and over Moel-yr-hyda. So essentially it’s a long, long slog up, technical steep descent, steep up, steep descent, short flat bit before more up, a steep descent and finally back onto the track you can put the foot down on. Being part of the 2015 British championships was really special. There was a real village fate/ gala feel to the event and the place was packed with 362 competitors, yet, as with part of what I love about fell running, if you didn’t happen to pass through the town that day then you would never know such a fantastic event was taking place. 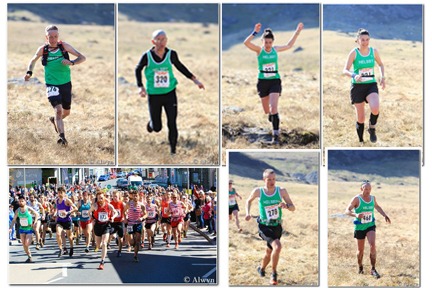 This, for me, makes fell racing special and one of the UKs best kept secrets. Andy Robinson must have had the wrong specs on, arriving head to toe in black thermals (full leggings, long sleeve top and gloves) under his vest as the nine Helsby runners toed the line in glorious sunshine. Interesting interclub battles afoot with Max and Jimmy fighting it out for the top spot, Phil Roberts and I both desperate for third place, a cracking run by George saw him split the difference between Phil R and Phil G and Phil, Jim and Andy all very close to each other made it a real battle for points. Having over taken me at the end of mile 2, Phil slowly edged ahead all the way up the Moelwyns whilst I cursed my road running legs. The section around Moel-yr-hyda was a real tussle as I took the lead on the way up and into the descent with Phil pushing to overtake all the way down. This battle boiled over in an act of pure timing as Phil saw his chance to overtake and I slipped in the same split second. The result was a flying backhander right across Phil’s face, cracking him on the nose and smearing his fancy new sunglasses with mud. Unfortunately this had the opposite effect one might expect and he flew ahead, but once we hit the track the familiarity of a hard surface enabled a late surge for the final mile or so. Since Phil has been calling me GBH since he has known me it was nice to finally earn the nickname, however at the rate Phil is gaining speed it won’t be long before I won’t even be able to see him in the final mile! In the end Max took top Helsby points, as did Jane, but neither made it into the top 100 on a day that saw the best of the best competing. Nothing could stop the smiles though and there was no doubt of a good day being had by all! The various Park runs are still the best way to get some regular hard work in. ten Helsby vests were out last weekend in Ellesmere park, Widnes, Ormskirk, Warrington and Delamere. A cheeky win for Colin Thompson too. Nice. AGM on Wednesday May 13th following our club run, 8:30 in the club house. It’s AGM time again — it comes around very quickly. Please come along to the clubhouse after our usual training run on Wednesday 13th May. Special for our AGM, pizzas will be served in the lounge first before we go upstairs to the tea room. It’s quiet up there so we should be able to all hear the proceedings – but be warned its in a very bad state of repair, unlike us! It’s a time to reflect the highlights of the past year (hopefully no low lights) and set the scene for the coming year. Please come along and share your ideas and thoughts for running (and much more) with Helsby Running Club in 2015/2106 and lets try and make it happen! The agenda and last year’s minutes are attached. Last year we increased the number of committee roles and this seems to have worked quite well. Spreading the load amongst more people enables us to do more as a club but there is always more we can do and things we can do differently. From the committee meeting held last week all members bar two are willing to stand again. Please note though that all the positions are up for grabs so if you wish to get involved in any of these roles then please let us know as we are always keen to have new faces on the committee as this breeds new and fresh ideas. It’s your club so please consider helping out in any way you can. 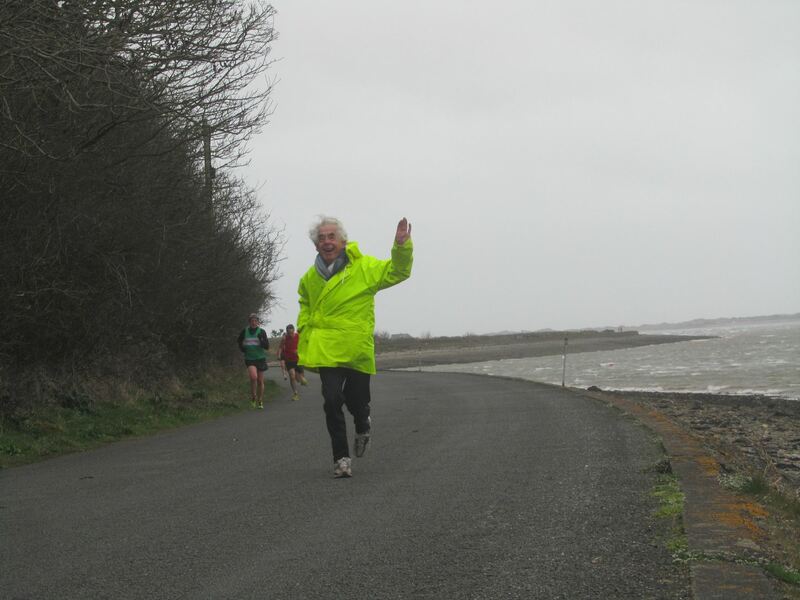 Sadly Gareth has decided to step down as 4 Villages Race Director; we thank Gareth for the last two year’s organisation. Laura B-H has volunteered to take over the position but if anyone else would like to take on the role or act as assistant please let me know. Adrian has moved to St Helens and although will still be running for us will find it more difficult to act as Border League co-ordinator. Thanks for the emphatic enthusiasm and encouragement in drumming up support for the series. For all committee roles, if you would like to know more on what they entail and what’s involved please ask me (jackiekeasley@btinternet.com, 07960 570827) or any of the committee. Committee elected at the 2014 Spring AGM. Wednesday 22nd April – Final Border League of the season at Wrexham followed by the Presentations. 7pm start, LL13 9RG. Meet up at the club at 5:45 for lift share. The men are aiming to close the gap between 1st and 2nd in the 2nd division contest (promotion assured if we get the turnout we have been getting all season) and the ladies consolidating their 4th (or even 3rd?) place in Division 1; plus several well earned individual Helsby category winners. Well done to all who have taken part over the season. Wednesday 29th April – Chris B-H will talk on Mountain Marathons and kit – the sorts of tricks people use to bring down weight, what they eat, which way to run, navigation, overnight camping, the ever growing number and type of events. To add balance to this Jane, Rachel, Lesley and Jackie will chip in with their experiences from further back in the field carrying heavier loads! (note change of date for this talk from that advertised a while back as the original date of the 15th clashed with the Spring 5). Friday 12th, 19th or 20th June – TBC (subject to the Tough Team Challenge date being announced!) – Annual Presentation Evening at the Club House, 8pm. Our annual prize giving for the Summer 2014 Road and Fell Championships and the 2014/2015 Cross Country and Border League Championships plus much more. Followed by a Bring Along Supper and Chris Igoe’s famous and energetic disco. Please note that subs will be due from the AGM, so please bring either cheque or cash on the night, or if it’s easier to do a bank transfer ask for account details and email me when done. Subs will remain at £35 for ordinary member, £25 for pensioner member (65+ for men, 60+ for lady at 1st May 2015) and £15 for junior member. Subs need to be paid as soon as possible after the AGM preferably by the end of May, but no later than the end of June. If subs are not received by the end of June, members will be resigned with England Athletics meaning they will no longer be affiliated with Helsby Running Club, will not be covered by EA insurance and will be subject to the £2 levy when entering races. To make my life easier, if you don’t want to renew your membership, please let me know and I will resign you from EA and quit bothering you with reminder emails. Helsby runners were out in force throughout the North West in Saturdays Parkruns. Highlights were a 2nd place and PB for Neil Finegan at Ellesmere Port, a PB for Chris Hatton at Widnes and a V50 age category win for birthday girl Helen Owens in her first race in the age category. Congratulations all. 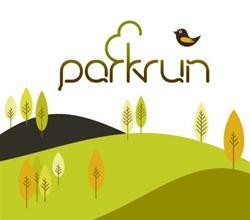 A I full report for all Helsby members at this weeks Parkruns can be found at the link below. On Saturday, Helsbys resident ultra runner, Andy Robinson, was in West Yorkshire and sent the following short report from the Calderdale Hike…. “I ran in the second race of the Runfurther ultra series on Saturday, the Calderdale Hike in West Yorkshire. This was a 37-mile route round the moors and valleys around the Calder Valley, on a complicated and scenic route. The Calderdale Hike has a new route every 3 years, and this was a new route year. As a consequence plenty of runners got lost or took less than optimum routes between checkpoints. I’d been out recceing the route, so managed to finish in a respectable time of 6.55. I was equal 11th from 75 finishers, 2nd MV50 and 2nd MV60. I’ve written a race report though, and you can find that on the Runfurther website: runfurther.com.”. Cheers Andy, well done. 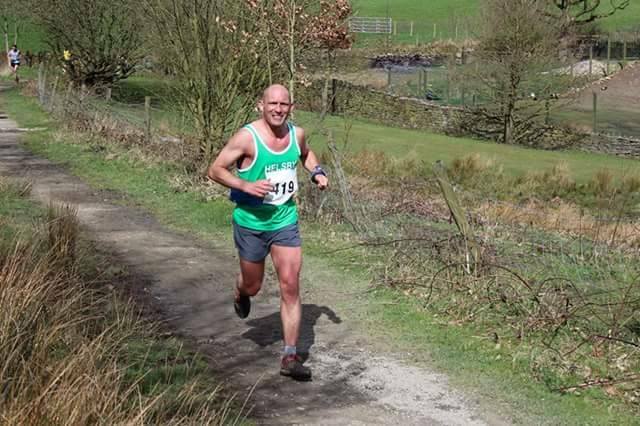 Also on Saturday Phil Roberts, Phil Gillard and Jamie Dowdall (who was running for Darwin) ran the Wardle skyline fell race. Phil came 38th in time 55.04, Jamie came 79th in time 59.24 and Phil Gillard came 86th time 01.00.47 . Phil Roberts reports that186 people took part the pulls were not to brutal but hit a cobbled road last quarter of the route and a small up hill to get to the finish which you could call the sting in the tail. 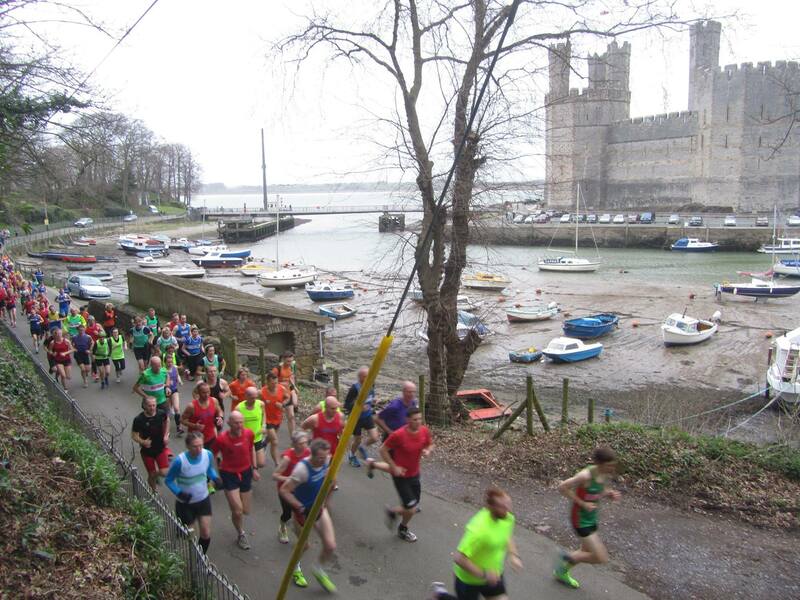 Sunday was the penultimate race of the Border League at Caernarfon, club captain Col Thompson reports…. “A race in gale force winds is never a good thing, or is it? 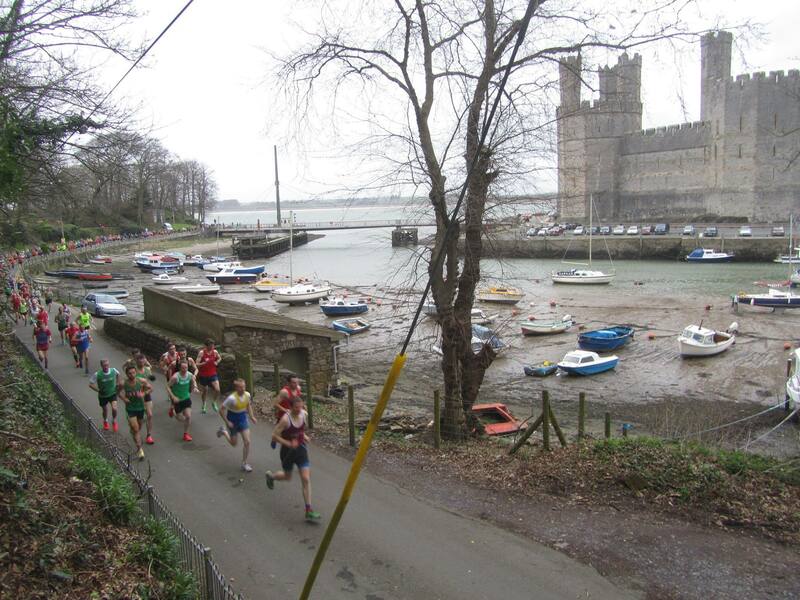 Judging by the amount of PBs acquired by the Green Army contingent at Caernarfon on Sunday it seems that when you’re blown towards the finish along a coast road by 60 mph winds it really favours those 10k times! Excellent running all. The results below speak for themselves with 10K PBs from Sue Buck, Adam Gordon, Jo Farwell, Shan McCarthy and myself, we had no fewer than 8 sub 40 min 10k times in the mens team, which really shows the depth in talent we have in the club now. As promotion looks more and more imminent we can start looking forward to next season and with results like these I’m sure we can compete with the best in the league. Congratulations to Colin Bishop for leading the men home with an excellent sub 35 min run and 1st in his age group, also a big shout out to Chris Fitzpatrick who is showing an amazing rate of improvement by breaking the magic 36 min barrier and a top 20 position. The men were 2nd in Division 1, just behind a strong Eryri squad. Well done chaps! It was panic stations in the ladies camp when a few almost never made it to the start line after a navigation error en route but arrived just in the nick of time! Jo Lacking led the team home and ran another blinder for a 42:48 time and 3rd in her age group and Carol Shaw once again won her age group with a fine display of running. Also well done to Debbie Read who had a superb race to grab 2nd in her age group on her maiden club race. The ladies were 5th in Division 1 on the day. Well done to all! 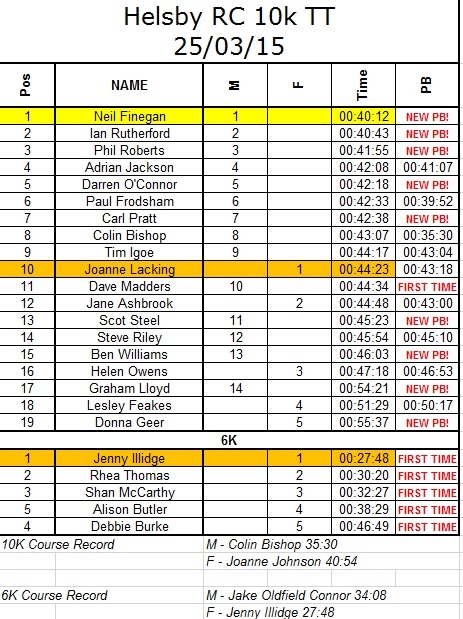 Also on Sunday, Steve Riley tackled the Mow Cop fell race for the first time and sent in this report. Cheers Steve and well done! 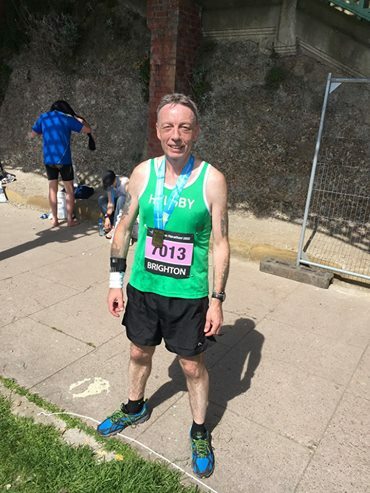 The same day Jim Jones journeyed to the South coast to compete in the Brighton marathon and, despite getting blocked in during the opening miles, was rewarded with a sub 3:45 finish in his first marathon. Great running Jim. An important reminder for next Wednesday night. Its the final Border League race at Wrexham Industrial Estate with the final team placings in the Mens and Ladies Leagues still to be decided. In particular the Men, whilst promotion to Division 1 seems likely as runners up, could still win the division with a strong showing so a good turnout would be greatly appreciated. An Email with further details, times etc will be going out over the next few days, please keep an eye out for it. As ever, please send you race reports to helsby-race-reports@outlook.com. Happy Easter everyone! A good turn out at the fells and roads at the weekend, seems everyone has been burning off those Easter egg calories! Thank you for all the reports this week, please keep sending them to helsby-race-reports@outlook.com. On Saturday Colin Thompson found himself toeing the line at the Halewood Triangle Park with a small number of local athletes for the monthly Halewood 5k. Perfect race conditions and a pancake flat course saw him run a sub 17 minute time, 4th overall and 1st in age category. This is a brilliant little race series and is part of a Grand Prix with awards and prizes on offer if you do enough races. The best thing is they are free! 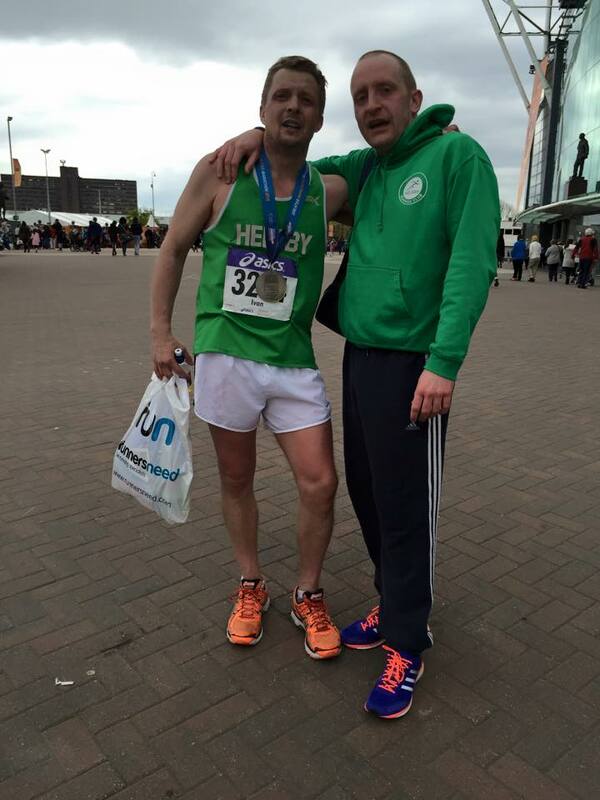 Colin Bishop travelled to Crewe on Easter Sunday to partake in the Air Products 10k. The course is described as “flat and fast” which Colin took full advantage of by belting out an eye watering 34:20 and 9th overall. Big congratulations to Colin for another superb time and PB! A new event from BTR saw the resurrection of the Hale 5 on Easter Sunday which has been absent from the racing calendar in recent years. Geoff and Janet Shaw ventured to Merseyside to represent Helsby and both had an excellent race with Geoff running a sub 40 minute time and Janet grabbing 2nd in her age category. Well done The Shaws! “So, there we were, the whole of Easter Saturday ahead of us, so many races, so little time, I thought I would give Helen the choice; Fran Four – no too remote, Rivi Pike – no too short, how about a trip to Bali – ooh that sounds great. Unfortunately my spelling isn’t great either, so when we set off on the M56, it wasn’t to the airport, it was to Lancashire and the village of Barley, just at the bottom of Pendle hill. Driving into the village, we were greeted to the colourful site of the kid’s races which had already started – loads of little fell running munchkins in club colours, all of them with the potential to become the next Brownlees. The village of Barley seems to be in a time warp, an honesty box in the car park, two thriving pubs, a village green and gentle stream running through. Registering at the village hall, there was no requirement for kit and the route looked like a subset of the Stan Bradshaw race a few of us ran earlier this year. Leaving Helen in the tea shop, my warm up took me on the race route, up past the reservoir and along Ogden Clough and so onto the race itself. Nearly three hundred entrants and we were off. A steady grind for about one mile up past the reservoir, following a track to the open fell, where the terrain got a bit rougher, this was also the route down, so as well as trying to gain places it was a case of scanning the best lines in readiness for the descent. Up onto the shoulder of the hill and then the route took us back down into the valley, allowing us a lung busting climb back up to the trig point. The number of spectators seemed to have increased, I guess the warm sunshine had brought out the rambling fraternity judging by the number of walking poles and gaiters. A lovely descent with a couple of technical sections to keep you interested and back onto the track by the reservoir for a fast downhill finish by the village hall. There was evidence of few ankle rolls and falls with a few ice buckets and blooded knees in evidence but everybody seemed in good spirit. 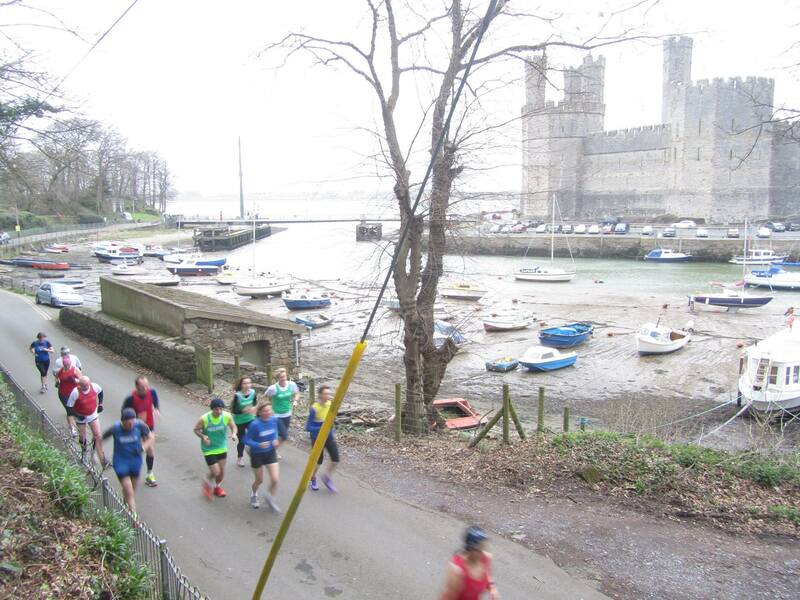 Please remember it is the penultimate Borders League on Sunday 12th April in Caernarfon. We need as many green vests there as possible, if you can spare a morning we would be most grateful. Info and directions can be found here http://www.bordersleague.org.uk/fixtures/. A number of people meet at the club house to share lifts, details can be found on our Facebook page. That’s all this week, if I have missed anything please get in touch and I will update the blog. Happy running all! Just a quick report from the LDWA Three Shires event which I completed today. The event has got a choice of distances, the basic route being 20 miles, and then you can choose to add a couple of different loops on to it. Adding both loops to the core route makes it 29 miles, which I went for. The weather was worse than forecast, with heavy showers off and on all day, making the ground even boggier than it would already have been. A lot of the paths were too boggy to be runnable, even walking was a challenge on some of them (getting my excuses in early). The first section of the run took us straight up Gun Hill and then across to and along the Roaches ridge path, where the wind was so strong that I didn’t dare to make the tiny deviation to visit the trig point. Then we went down to Gradbach, and across the bridge at Three Shires Head where Cheshire, Staffordshire and Derbyshire all meet. The first optional loop came before checkpoint 2, an extra 2 miles straight up and down Shutlingsloe (Cheshire’s Matterhorn, as somebody pointed out to me halfway up). For anyone who doesn’t know it (as I didn’t) it’s basically a massive conical hill, every route up to it is steep. The weather cleared at the top and gave a distant view of Beeston Castle. Then to the second checkpoint for tea and cheesy oatcakes, plus malt loaf and hot cross buns (and loads of other stuff). Then the second optional loop, a 7 mile section in Cheshire, some of which was a slog and just felt like doing miles for the sake of it, which ended back at checkpoint 2. The final section was better, going high across the moors and below the Hanging Stone back to the start, for a lovely meal of salad and quiche, plus pudding and more sugary tea. I finished in 7h 40m, which I’m a bit disappointed with. Having run quite strongly in the first section, Shutlingsloe just took all the energy out of my legs and from then on I could only run parts. Then we had Jim Jones and Tim Palmer flying the flag for Helsby RC at the Llantysilio Fell Race on Saturday. The race route takes in just over 6 miles of the Dee Valley with 2100ft of ascent along the Llantysilio mountain ridge. Gale force winds on the highest parts of the ridge made for challenging conditions. The marshals from Tattenhall Runners did a great job hosting the race. The marshal by the trig point on Moel y Gamelin did particularly well not to get blown off the mountain! This year saw a different and improved route off Moel y Gamelin. 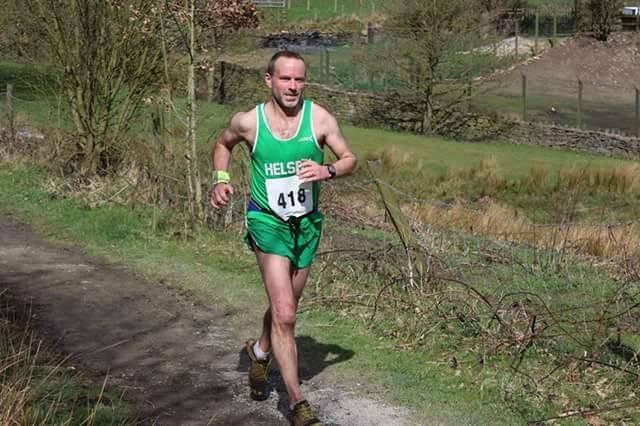 At the time of writing, there are still no results up but the race was won by Rob Grantham of Pensby, with Helsby runners Jim Jones and Tim Palmer finishing 21st and 28th respectively. 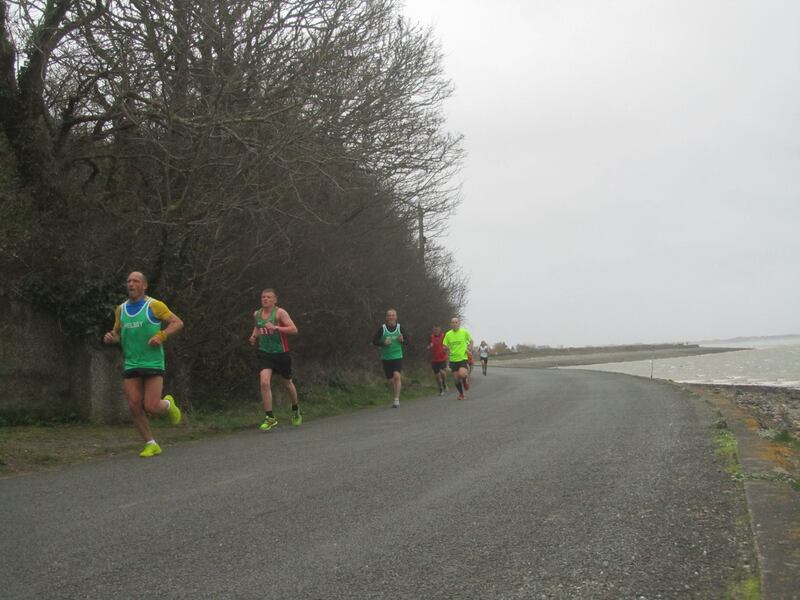 The 4th Vale of Clwyd 10k took place in Llandyrnog on Sunday. 87 athletes set off in a torrential downpour and waded through ankle deep water in some parts of the course. 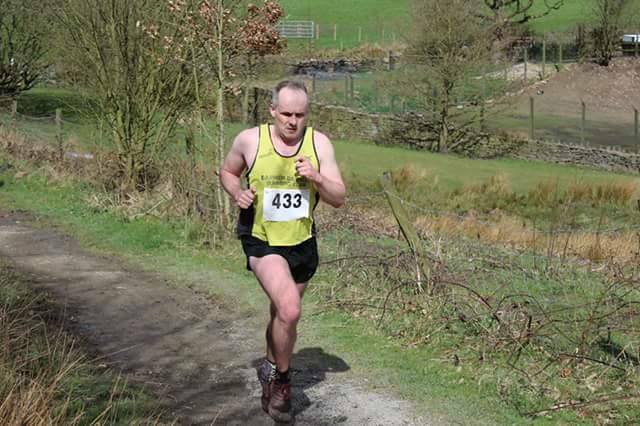 Helsby was represented by Jim Jones who finished in 6th place and won the M40 category. The Helena Tipping 10K was held at Wrexham Industrial Estate in wet and windy conditions on Sunday which affected the finishing times throughout the small field. Colin Bishop and Gary O’Connor were the only Helsby representatives with Colin coming 3rd overall and 1st MV55 and Gary finishing 15th and 2nd MV45. Both on great form but I do have to mention that poor Gary had a poorly ankle and also cycled a few miles to the race. What an inspiration he is to Ironmen. I shall fast forward through all the Joanne Lacking dithering to get ready and go straight to the race. Liverpool Half is not the easiest course, you would imagine it is flat but the first half isn’t and then the last section is quite twisty. It is very well organised and well supported (even in the rain). The weather ended up working favourably for many of us and all had a great run. 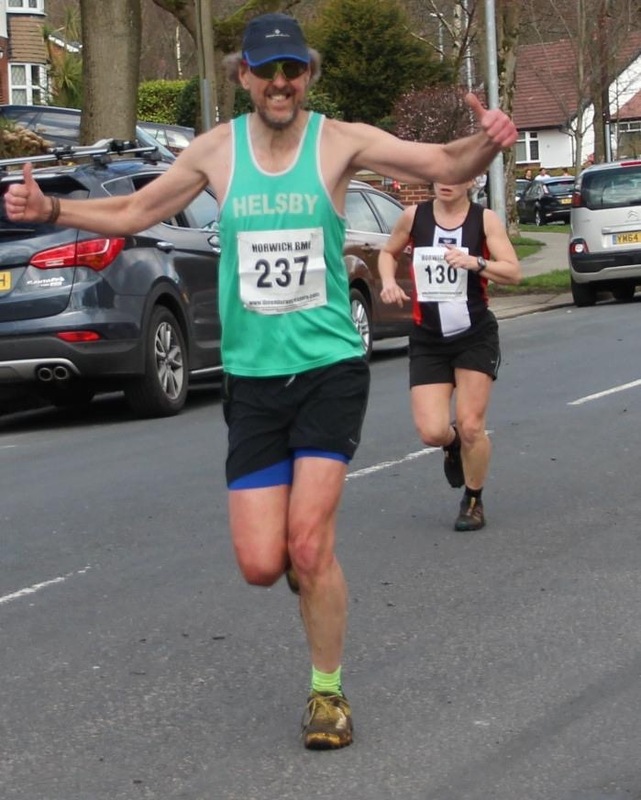 The super duper athlete that is Colin Thompson (no relation to Daley, I am told) was first in for Helsby and had as usual, a very fast run with a fantastic 1:17:47 and 19th place overall. Following Colin from behind was the Squirrel aka Chris Fitzpatrick and a brilliant PB of 1:18:48, (32nd place) which puts him in great form for London marathon to smash his marathon PB. He even manages to carry a very fancy water bottle throughout too, what a man. His partner in their tarmac slapping, London training road crimes, and who has shocked many local running folk by hanging up his mountain shoes for the time being, for road ones (and according to Strava, he sometimes uses a TREADMILL!) Chris Baynham-Hughes ran a cracking 1:22:13 and the sub 3 dream looks like it will be a reality. Well done Chris. Then we have Carl Pratt, who not only smashed his Half PB to bits by running a 1:30:13, he also ran a 5k PB the day before at Widnes parkrun! Brilliant running! Behind Carl was our new firecracker, Darren O’Connor who is gaining pace at a tremendous speed and ran a 1:31:14. On to the females and the first spot goes to Joanne Lacking, who is consistently knocking out brilliant runs and ran an extra 7 miles including the Half, (which she treated as a training run for London marathon) and STILL ran a course PB and a cracking 1:34:02. Then there was me…. A course PB was had (1:43:18) and I also ran an extra 7 miles with the Athlete Lacking so a good result for me for a training run. On to what has to be the biggest PB in the shortest time in Helsby history, Rhea Thomas knocked a huge 18 minutes from her Wrexham Half time last month., huge congratulations to Rhea! Stephen Roach, who is running London dressed in chef’s whites carrying a huge heavy pan with the aim of getting a world record, ran Liverpool as a practice run in his chef regalia (complete with pan of Scouse) and unbelievably managed it in 1:53:27! Well done Ste, that is some achievement. Good luck for London. Then we have Claire Swift who ran a cracking 2:04:22 to bring our little Liverpool run to a close. Well done everyone. Another excellent turn out at the 10k Time Trial last Wednesday, thank you to everyone who turned up and took part. A storming run from Neil Finegan to take the win showed how well he is progressing as is Jenny Illidge who broke the 6k course record again! Also well done to Jo Lacking for another win for the ladies. A special thank you Joe, Louise and Tanya (Timing) and Mario (Marshall at School Lane).